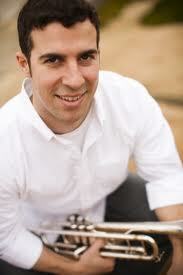 Born and raised in Falls Church, VA, trumpeter Steve O’Connor joined the Presidio Brass in July of 2011. He enjoys an active freelance career in the Los Angeles area, including performances with the Los Angeles Opera, Pasadena Pops, the Ojai Festival Orchestra, the California and Riverside Philharmonics, as well as Santa Barbara, San Diego, Pasadena, Redlands and San Bernardino Symphonies. Steve has also performed with the Moscow Symphony during a tour of the United States. As a chamber musician, he performs with Jacaranda, the Mládí Chamber Orchestra, Pacific Brass Ensemble, and at various chamber music venues throughout Los Angeles. In addition to performing, Steve serves as a trumpet instructor for the Bob Cole Conservatory of Music at the California State University in Long Beach and at the Idyllwild Arts Academy. He earned a Bachelor’s degree in music from Michigan State University and a Master’s in Music from Cal State Long Beach. His teachers have included Tim Morrison, Jim Wilt, and Dave Washburn.